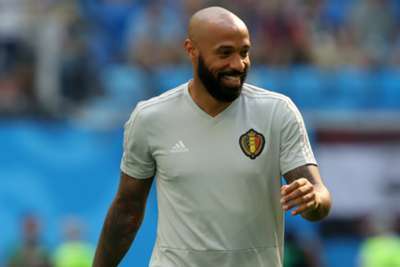 Thierry Henry says he needs time to work with Monaco if he is to turn results around at Stade Louis II, although he has not written off a Champions League push this term. The 1998 World Cup winner has taken on a role as a head coach for the first time, opting for Monaco over other reported suitors despite their current struggles at the wrong end of Ligue 1. Henry is keen to start work, but he wants to make it clear from the outset that results will only follow if he is able to get his message across on the training ground. "You all know results are all that matter, but results are the consequence of what goes before," he told a news conference. "I don't like to use the word 'win', but winning only happens if you have worked well." Monaco have just six points from nine matches, yet Henry, while under no pressure from vice-president Vadim Vasilyev to deliver, is not putting a limit on his ambitions. "As long as there are enough points possible, [finishing in the top three] is possible," he said. "It's a long, hard job, but we'll see what's possible." And the new coach has already identified areas in which Monaco can improve, adding: "We first need to stop conceding, then we need to find balance. I won't go into details on how, but we need to find some security, with intelligence. "Then [we have to work on] how to work when with the ball to have numerical superiority over opposition, while retaining balance when in possession. "You also need to be able to be flexible. The opposition may give you something you need to change so you may need to change at half-time. You might need to sit low, you might need to press, you might need two or three on the ball." Monaco's project has been a subject of contention, with the club repeatedly selling their top stars, but Vasilyev, appearing alongside Henry, is confident they are still moving in the right direction. "We're convinced our project is the right one. It works. Just look at recent years' results," he said. "All teams have tough periods. "We're having one now but that doesn't mean we'll change the project. We need to get out of the relegation zone."